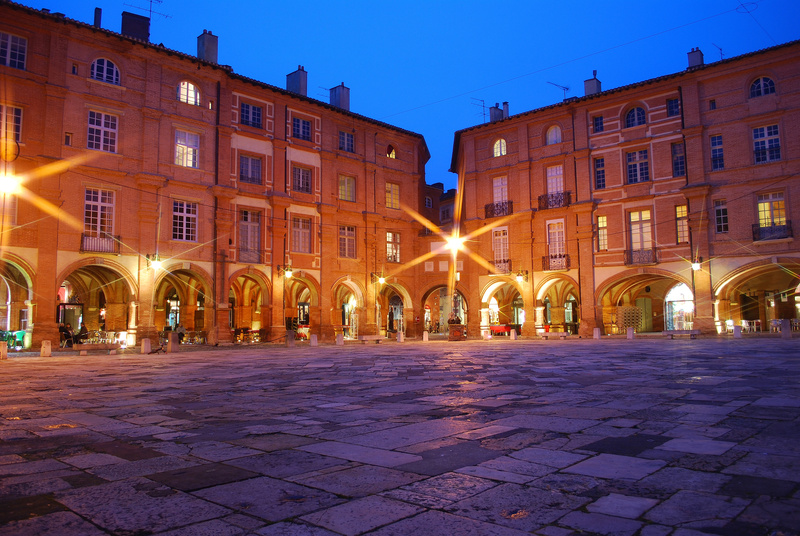 Previously part of Quercy and Languedoc, Tarn et Garonne is now located in the Occitanie region and takes its’ name from two rivers, the Tarn and the Garonne. It was Napoléon Bonaparte who created the department in 1808 by taking parts of the Gers, Lot, Lot et Garonne, Haute Garonne and Ayeyron. 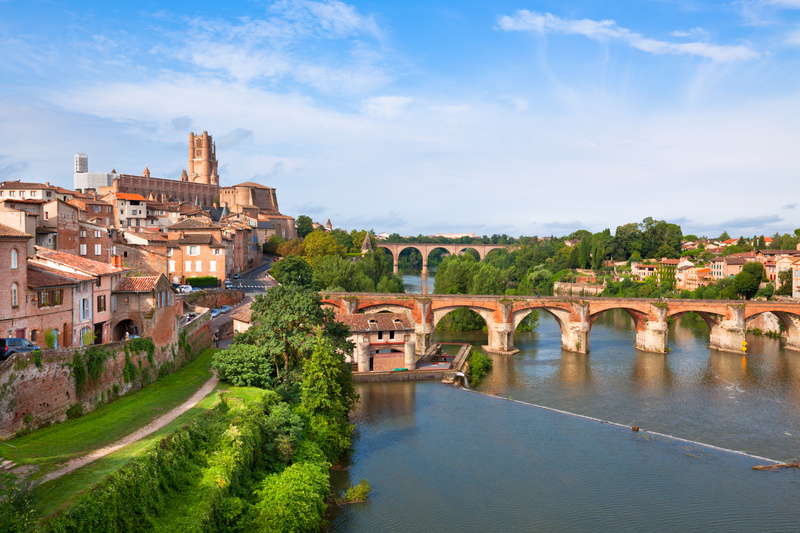 The region is known for its fertile agricultural land, hilly areas dotted with vineyards and its’ beautiful Canal des Deux Mers which comprises the Midi and Garonne canals, linking Toulouse and Bordeaux. Wines from this region, like Fronton and Coteaux du Quercy, reflect the earthiness of the rich soil and are served with equally rich dishes such as cassoulet, a delicious stew packed with beans, pork, bacon and goose or duck confit. Ideal for nature lovers, the region boasts a number of fascinating natural sites. These include the rugged Gorges of the Aveyron, a group of sheer limestone cliffs which overhang the river and are perfect for hang gliding or, in the river below, canoeing. The Bonnette river valley has a wonderful array of flora and fauna as well as squirrels, deer, kingfishers, herons and hoopoes and, as a result, has been classified as an ecological nature zone. Another ecological nature zone can be found at the Agre Forest at Montech. Here, families and ramblers alike can enjoy over 1000 acres of forest filled with oak and pine trees, deer, wild boar, rabbits and even the odd polecat. Bird watching is particularly fruitful with many protected species such as the black kite, the night jar, Dartford warbler, the booted eagle and the descriptively named short toed Jean-le-Blanc. One of the most beautiful villages in France with its limestone, pink brick and grey pebbled features, Auvillar was once a port on the Garonne river. 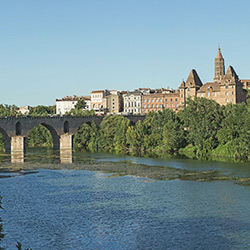 As the prefecture of Tarn et Garonne, Montauban was recognised as a ville d’art et d’histoire in 2015. 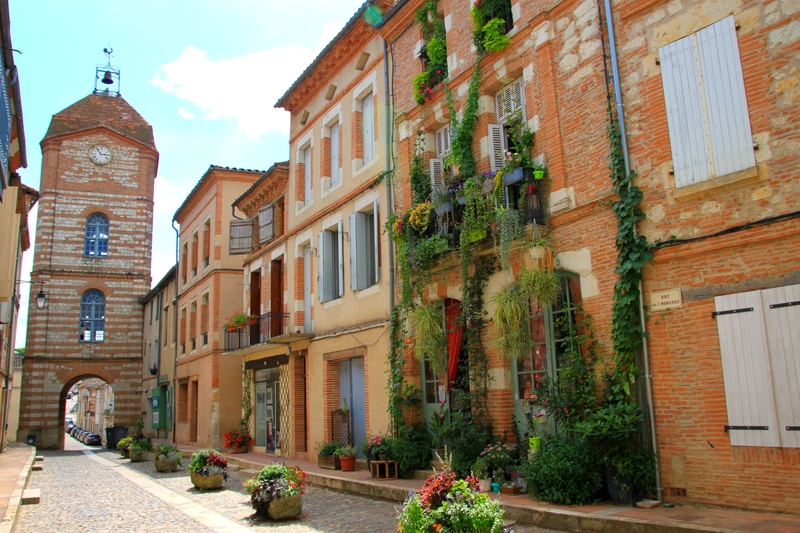 It is hardly surprising, this 10th century bastide was founded by the Count of Toulouse and is the second oldest bastide in southern France. As a protestant centre in the 16th and 17th centuries it refused to acknowledge the Catholic King and was subjected to 400 cannonballs from the King’s army. The townsfolk stuck it out and eventually the King retreated but the town’s Saint Jacques church still bears the scars. Now a city, Montauban still celebrates “les 400 coups” in September every year. Other places of interest include Pont Vieux, a pink bridge commissioned by King Philip the Fair in 1303 which took 30 years to complete. The Cathédrale Notre Dame de l’Assomption is a masterpiece of three royal architects and features four evangelist statues on its glorious façade. For lovers of art, an underground chamber known as the Hall of the Black Prince in the Musée Ingres, houses Jesus among the Teachers of the Law by Jean Ingres, the celebrated painter born in Montauban. Sculptures by another local lad, the famous Antoine Bourdelle, are also on display. Without doubt, the city has had an interesting past, including the hiding of Leonardo da Vinci’s Mona Lisa in a secret vault behind a wine cellar during World War II. One of the most beautiful villages in France with its limestone, pink brick and grey pebbled features, Auvillar was once a port on the Garonne river. Fortified and known as Villa Alta in Roman times, it boasts monuments such as the unique Angles, a circular hall in the centre of a triangular square in the centre of the old town. Other points of interest include the Church of Saint Pierre and its original architecture, the Sailor’s Chapel and the Louis XIV Clock Tower. 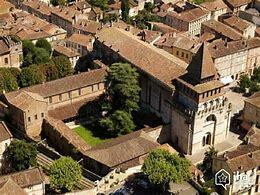 As a stop on the pilgrimage route to Campostella, Moissac has both religious and artistic heritage. The Saint-Pierre abbey with its 15th century Cloister boasts one of the most elaborate Romanesque portals of the 12th century with its Tympanum and Trumeau. By taking a walk by the old Convent, you will also come across the statue of the Virgin Mary which overlooks the town. Equally impressive is the Pont Canal du Cacor, one of the largest canal bridges in France. Built in 1846, it has a span of 356 m across 15 arches and carries canal boats over the river Tarn. Why not stop in a café and savour the local AOC Casselas de Moissac, made from a golden grape, and order some foie gras and, of course, prunes. As one of the most important crossroads in Gascony Lavit de Lomagne was once HQ of the royal court and a major trade centre. 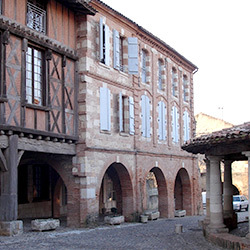 The Maison de Lomagne now displays a complete history of the town from its origins and agriculture through to crafts and trade. Another trade centre, although now known for its hats and Coteaux de Quercy truffles, is Caussade. Captured by the Crusaders during the Albigensian war in the early 13th century, it enjoyed prosperous trade with Bordeaux and Toulouse in the 18th century. Houses from the 17th and 18th century line its streets and the Museum of Archaeology illustrates the town’s tumultuous history from prehistoric times to the middle ages. 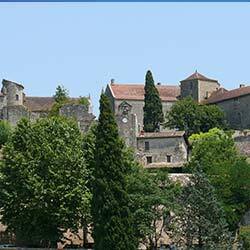 Both old and new castles can be seen at the Chateaux de Bruniquel which overlook the Aveyron and Vere valleys. Queen Margot and her “gentleman friend” took refuge from the King of France in Chateau de la Reine Margot at St Projet in the late 16th century. When she left, “her room” was walled up but, luckily for us, it was discovered in 1990, complete with all its furniture. A guided tour takes visitors through this area and highlights fresco decorated rooms as well as furnishings from the 16th and 17th century. The museum Aux Outils d’Antan at Verfeil houses a collection of more than 1,000 tools and utensils used through the centuries, whilst the Museum of Culinary Arts at Belleperche Abbey in Cordes Tolosannes illustrates the development of tableware and drinking vessels from the middle ages. Anything but simple, the medieval-styled Le Jardin des Simples at Montauban displays medicinal, ornamental, vegetable and fruit plants. Combining architectural remains at the foot of the old ramparts with an interesting game, Le Jardin du Pèlerin at Lauzerte takes the visitor along a path of discovery, similar to that of a pilgrim. Reflecting the Saint Jaques de Compostela Way the “Way of Stars”, as it is called, uses photographs and song to take them to the Jardin de l’Oie (Paradise). 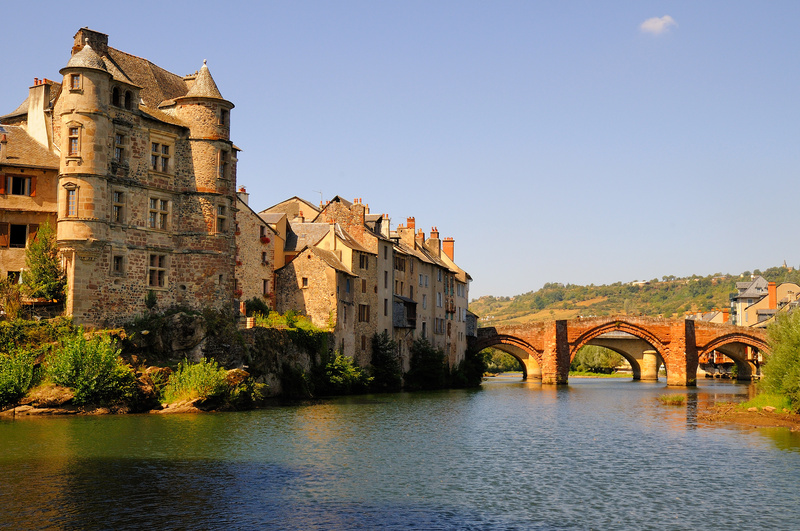 Whether you crave being at one with nature, want to study outstanding architecture or simply wish to relax, Tarn et Garonne has much to offer. There is no shortage of pretty village either such as Bruniquel and Lauzerte which both offer guided tours, are also listed as some of the most beautiful villages in France. I like my cassoulet with a bit more flavour than the norm. I also just kind of throw it all together. So this is a recipe that allows you to do that too. – Fry a couple of onions and a few garlic cloves (and a chilli if you like) in some olive oil in a big frying pan. Remove when just starting to brown. – Add some sausages (Toulouse are good) to the oil, together with lardons, brown and remove. Do the same with your choice of chicken, lamb shank, pork. Remove. – Add duck confit and brown (saving the fat from the packet for roast vegetables another time). Once everything is brown, put it all back into a casserole dish. – Add a pot pourri bundle (rosemary, thyme, marjoram – whatever takes your fancy), add a few bay leaves from the garden, three beef stock cubes dissolved in about a pint of water, salt, pepper and a bottle of red wine. 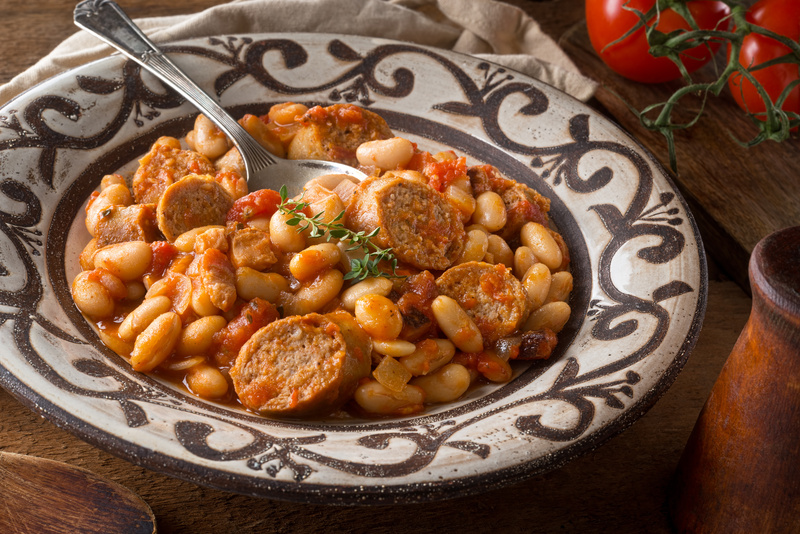 – Finally, add a large tin of white beans. Cover and cook in an initially hot oven, then turn it down to around 170°C. Then leave it for about three hours. What you finish up with is a serving platter full of different meats, beans and a red wine jus. Serve with salad and mash pots to soak up the sauce.